Situated amid the East Kent marshes Richborough is perhaps the most symbolically important of Roman sites in Britain. It is thought by many that the four invading Legions under Aulus Plautius assembled in Richborough after landing in Britain during the Claudian Invasion of A.D. 43. Fast forward nearly 1900 years and troops were heading back into Europe. 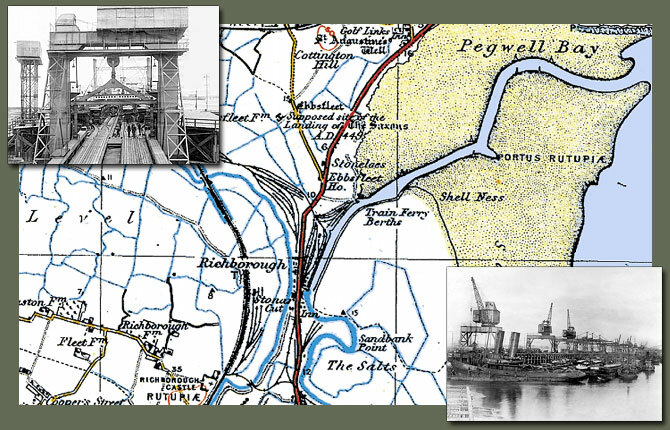 In January 1916 during the height of WWI, it was decided to develop Richborough as a depot and base for inland water transport to service the troops. At this time Richborough consisted of a short length of quay suitable for barges, and one solitary dwelling house. By 1918, the enormous feat had been completed of transforming Richborough into a large and well- equipped seaport, of 2,000 acres, complete with all services and capable of handling 30,000 tons of traffic per week. 2,300 ft of new wharf was built for the cross-channel barge service, in which, at the end of the war, 242 barges were employed, including ten of 1,000 ton capacity. Among the new ports features was what we we today call a “roll-on, roll-off” ferry – for railway trains. Among the many tons moved from Richborough were complete trains carrying tanks, direct from the factories to the British army on the front line. The use of train-ferries greatly reduced the amount of labour required in the transport of these items. It took only 30 to 40 minutes to load or unload the 54 railway wagons and fifty or sixty motor vehicles that could be carried by these train-ferries. An analysis done at the time found that to transport 1,000 tons of war material from the point of manufacture to the front by conventional shipping means involved the use of 1,500 labourers, whereas when using train-ferries that number decreased to around 100 labourers. So well camouflaged was the port, that it became known as the Mystery Harbour. All port buildings were one-story, their walls and roofs were painted to match the general background of a low-lying area. The military secret was so strictly and carefully observed by the British, that the existence of the port had been unknown to the Germans during the whole war; the port was often overflown by the aircraft heading to drop bombs on London, where the bombs were striking civilians, but no bombs were ever dropped on Richborough. After the signing of the Armistice on 11 November 1918, train ferries were used extensively for the return of material from the Front. Indeed according to war office statistics, a greater tonnage of material was transported by train ferry at Richborough in 1919 than in 1918. The returning train ferries had space for motor transport as well as railway rolling stock, thousands of lorries, motor cars and “B Type” buses also returned via this route. It’s a little known fact that buses transported troops to and from the Front Line and were put to use as ambulances and even mobile pigeon lofts. Nearly 1,200 London General Omnibus Company vehicles went on war service, most to France and Belgium, with some travelling as far afield as Egypt.